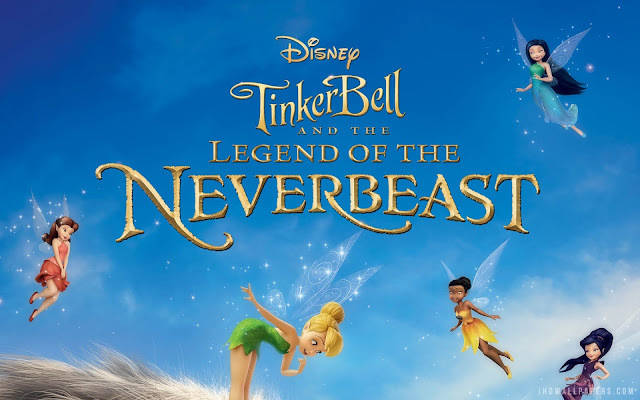 Tinker Bell and the Legend of the NeverBeast is an American computer-animated film directed by Steve Loter. It is the sixth full-length and seventh film in the DisneyToon Studios' Tinker Bell film series, based on the character Tinker Bell from J. M. Barrie's Peter and Wendy. It was released theatrically in selected markets including the United Kingdom on December 12, 2014. In the United States, it had a limited theatrical release, opening on January 30, 2015 at the El Capitan Theatre for a 13-day engagement, and was released direct-to-video on March 3, 2015. Mae Whitman, Lucy Liu, Raven-Symoné, Megan Hilty, Pamela Adlon and Anjelica Huston reprise their roles of Tinker Bell, Silvermist, Iridessa, Rosetta, Vidia and Queen Clarion. Ginnifer Goodwin joins the cast, replacing Angela Bartys as the voice of Fawn in this film, Rosario Dawson joins the cast as new character, Nyx and singer Mel B also joins the cast as new character Fury in the U.K. version while Danai Gurira voices Fury in the U.S. version. Meanwhile, in Pixie Hollow, an ambitious scout fairy named Nyx also heard the roar, and decides to investigate. She too happened upon the beast and does research in the fairy lore library to find out what she's up against. Using some pieces of information gathered from several torn pages of an undisclosed animal-book, she discovers that Gruff is a creature that awakens about once every thousand years, where it would transform into an even more ferocious beast that could destroy Pixie Hollow with a mysterious series of events that leads to a deadly storm. Queen Clarion urges both Fawn and Nyx to work together and "do the right thing" regarding the protection of Pixie Hollow. Each fairy takes this edict to mean different things; Fawn sets out to help Gruff complete whatever mysterious task he intends to carry out, while Nyx is determined to capture him and prevent the impending storm. Gruff indeed transforms into the monster depicted in the fairy lore, but his intentions are a surprise to all as Gruff is in fact trying to save Pixie Hollow by collecting all of the lightning through the towers he built thus preventing them from hitting the trees and causing a fire. He had saved Tink from a falling tree, and protects Nyx from a lightning blast. Fawn has Gruff fly high into the sky where he absorbs the lightning storm. This causes the storm to end, and burn Gruff's wings and kills Fawn. The Neverbeast revives her with a small shock of the lightning he absorbed. Following the event, Gruff feels very tired and the fairies send him off to a cave where he will sleep for another thousand years.